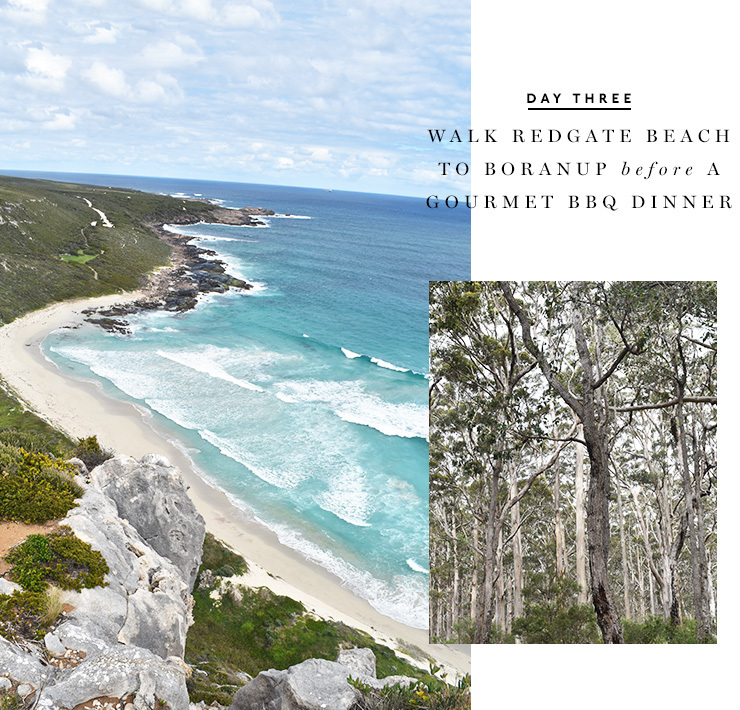 Our beloved Margaret River region really does have it all – incredible beaches, gourmet food, world-class wine, sweeping vistas and luxury boutique accommodation. So what if you were able to combine all of these things in what could be one of the best trips of your life? 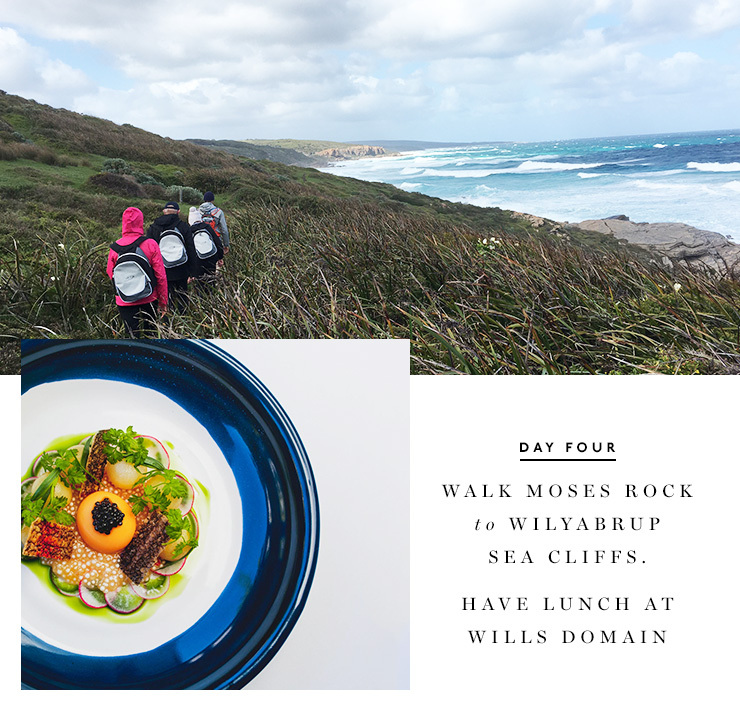 Having recently been announced as WA’s first Great Walk Of Australia, I headed down to Yallingup to experience the Walk Into Luxury four-day tour myself. Heads up: it was freaking amazing. 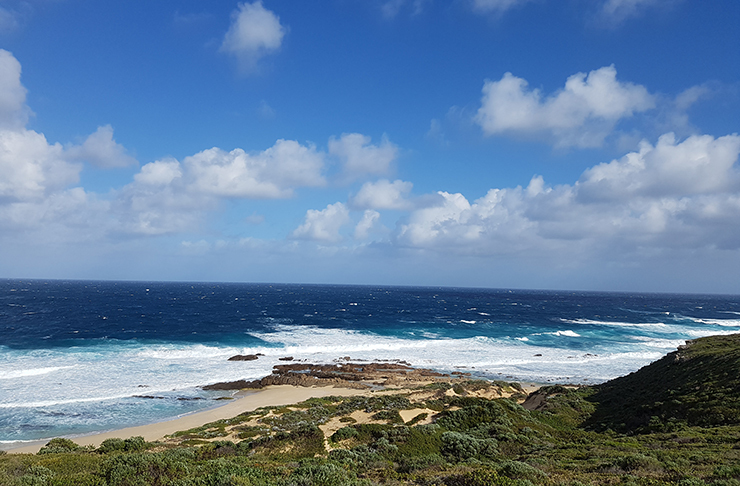 For those not familiar with the cape to cape, the 135km coastal track located within Leeuwin-Naturaliste national park extends from Cape Naturaliste (near Yallingup) in the north to Cape Leeuwin (near Augusta) in the south. 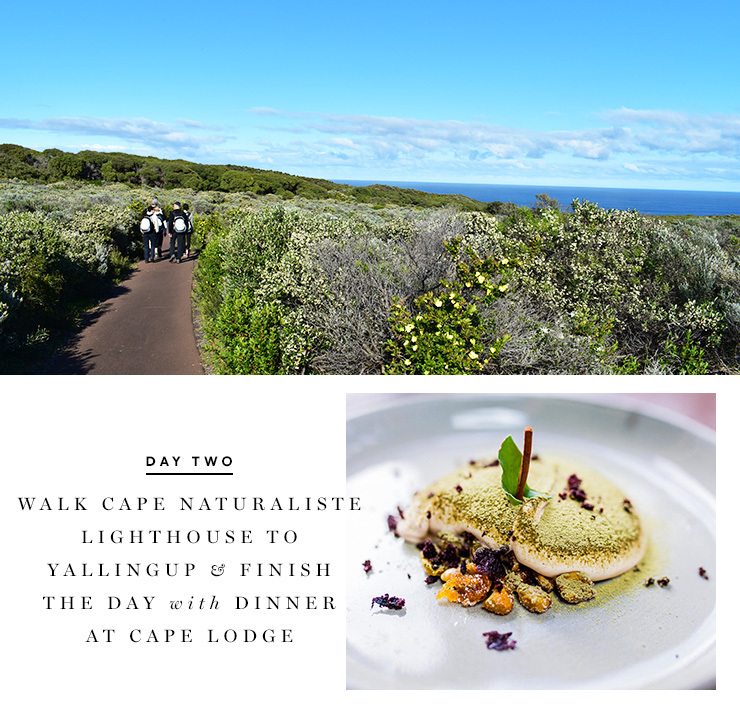 As the name suggests, the Walk Into Luxury tour is more than just hiking chunks of the cape to cape. In fact, It really should be called Walk, Eat and Drink Into Luxury because the all-inclusive package has as big a focus on the eating, drinking and being pampered part as it does the walking part. It really does enable you to experience the south west at its finest and in absolute luxury—my kind of trip! One of the best kept secrets down south, driving into Injidup Spa Resort is like entering some kind of luxurious dream world. 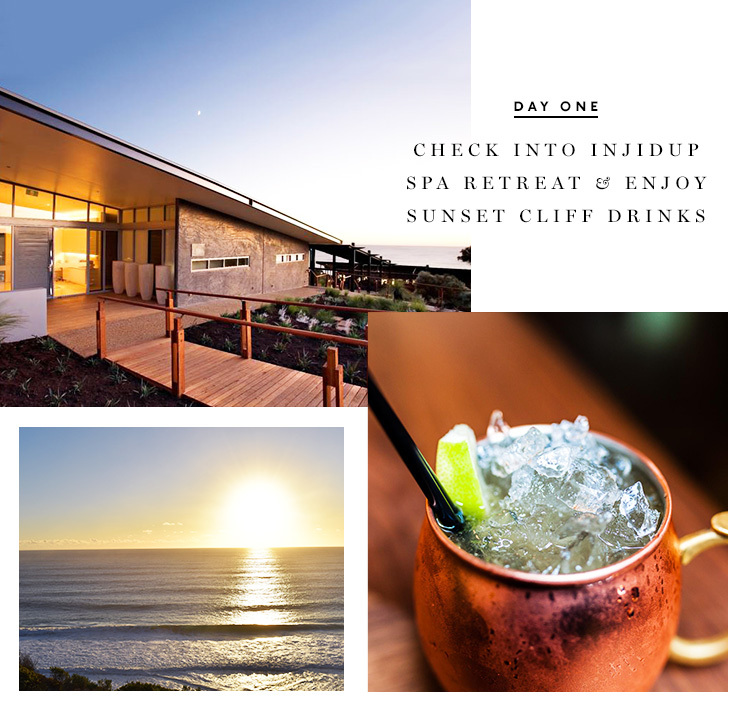 A member of the Small Luxury Hotels of the World, Injidup is an intimate coastal retreat that promises tranquillity, luxury and fabulous ocean views….and more than delivers it. There are only 10 villas here—all with their own plunge pool and decked terrace, which looks out to what has got to be one of the most incredible views in WA. I’m talking breathtaking 180-degree views that will knock your socks off. There’s two bedrooms, each with an enormous bathroom, heated flooring, an open eco fireplace, floor to ceiling window as well as an interior that is to die for. It is pretty much the most amazing place I have ever stayed and if I could move in, I would! Having unfortunately missed today's 5.5km walk from Smiths Beach to Injidup, I arrive at around 3pm and make myself comfortable in my home for the next four days, before joining my three fellow walkers for spectacular clifftop sunset drinks followed by a gourmet platter by the fire. I fall into a blissful sleep (hello most comfortable bed I've ever slept in!) ready for a big day of walking the next day. After waking to the blissful sounds of waves crashing on Injidup beach, I tucked into the gourmet brekky hamper (all locally sourced produce of course) before meeting our driver and guides (shout out to the amazing Dean and Diane!) at 8am for our drive to Cape Naturaliste Lighthouse. From here, we set off on the 14km track to Yallingup. The first 3km is all boardwalk and gently slopes down to Sugar Loaf Rock but then things got a bit tougher as we cruised past Bear’s surf break and on to the beach before heading inland on a 4WD track and then hitting Yallingup beach. While the walking was intense in some parts, we stopped plenty of times (often to check out the wildflowers and native animals, much to the delight of my New Zealand walking partners) and of course to take snaps of the spectacular scenery and eat our delish lunch and snacks that came courtesy of Lamonts. After a quick well-earned arvo nap back at Injidup, it was time to head to Ngilgi Cave for a private cave tour and didgeridoo performance (one of the highlights of the trip) before we’re transferred to Cape Lodge for a four-course dinner with matched wine. We've earned it! My calf muscles were definitely a bit stiff this morning from the soft sand walking but it's the last day and we only have a measly (ha) 8km to get through. Another delicious brekky gets polished off before we’re driven to Moses Rock for our walk to the Wilyabrup sea cliffs, a stunning track that rises high over several large limestone headlands before heading up on to the stunning sea cliffs that form the famous climbing buttresses of Willyabrup Cliffs. We’re then taken to Wills Domain for one last incredible meal (a four course lunch with matched wine) and to toast an incredible few days. I loved every single minute of this trip. The Walk Into Luxury crew really do choose the best and most diverse parts of the cape to cape and the scenery was just mind-blowing—I honestly had my neck craned towards the coast line for the most part. Even as a regular visitor to the south west, the wide variety of terrain we covered in three days of walking (limestone cliffs, caves, coastal bushland, forest and beaches) was just amazing and our guides were so knowledgable about the landscape and history of the area. What really takes this tour to the next level is that every little thing is taken care of, from the luxury car that was waiting to drop us off every morning and pick us up every afternoon, to the incredibly lunch hampers that were prepared for us each day and getting to experience the best food and wine the region has to offer. It’s obviously not a cheap expedition (the 4 day group walk is $2490 per person twin share) but it really is a once-in-a-lifetime trip and would be the perfect special occasion getaway. Looking for more south west goodness? Check out these South West Homewares Comapnies We Love!